I have been advertised that the chief trade of Persia is into Syria, and so transported into the Levant Sea [Mediterranean]. The few ships upon the Caspian Seas, the want of mart and port towns, the poverty of the people and the ice, maketh that trade not. So commented Anthony Jenkinson, intrepid representative of the English Muscovy Company during his epic journey through Russia and Central Asia in 1558-1560. In search of new trading partners and an overland route to the wealth of China, Jenkinson’s explorations were not only a remarkable feat of adventurism but they also allowed for some of the first English-language accounts of a region still oft-overlooked thanks to their inclusion in Richard Hakluyt’s The Principal Navigations, Voyages, Traffiques and Discoveries of the English Nation. The land encompassing the Caspian Sea – a still controversial designation for this massive landlocked body of water – rarely makes the headlines, only momentarily garnering attention for a recent agreement hashed out Aktau between Russia, Kazakhstan, Turkmenistan, Azerbaijan and Iran. After decades of dispute, the five littoral states bordering the Caspian have agreed to share its resources and work together to prevent outside powers from setting up military bases on its shores. Rich in oil and gas, it is a prudent step to douse this particular geopolitical flame. 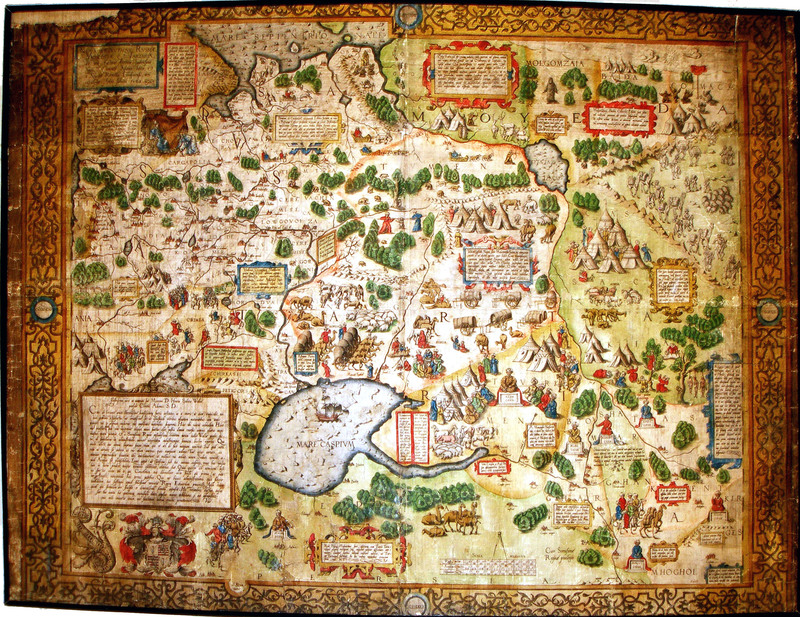 When Jenkinson – a native of the quiet Leicestershire town of Market Harborough – travelled the region in the mid-1500s, he encountered a wild land of nomads and bandits, whose conceptions of commerce differed widely from his own ‘sophisticated’ notion. From the Caspian Sea unto the castle of Sellizure aforesaid, and all the countries about the said sea, the people live without town or habitation in the wild fields, removing from one place to another in great companies with their cattle, whereof they have great store, as camels, horses, and sheep both tame and wild. Yet if the Caspian of the 16th century was beyond his comprehension, imagine what the merchant would think of today’s Baku, the oil-rich capital of Azerbaijan, with its sparkling modern facades and nouveau-riche adornments. a strange thing to behold, for there issueth out of the ground a marvelous quantity of oil, which serveth all the country to burn in their houses. This oil is black and is called nefte. There is also by the town of Baku, another kind of oil which is white [petroleum] and very precious. Indeed the modern petroleum industry threatens to wreak environmental disaster on the Caspian, with oil run-off and chemical disposal poisoning its waters at an alarming rate. If the five signatories do not take action soon, then the Caspian threatens to follow the Aral Sea into ecological oblivion. Jenkinson thought that the Aral ran into the Caspian, yet today the former is barely recognisable as a water body, its desiccated plains more reminiscent of a desert. What was, and remains, true about his observations, however, is the ‘wildness’ of the Caspian. Beyond the oil wealth there is impoverishment and turmoil. Iran sits on the Sea’s southern border, scheming to bend the region to its will. Kazakhstan and Turkmenistan remain mired in post-Soviet decay to the east, whilst to the north is the restive Russian province of Dagestan, long a source of discontent that Moscow has sought to quell. This Astracan is the furthest hold that this Emperor of Russia hath conquered of the Tartars towards the Caspian Sea, which he keepeth very strong, sending thither every year provisions of men and victuals, and timber to build the castle. Jenkinson could almost be writing about Vladimir Putin and his determination to ensure the loyalty of his southern lands (many Muslim-dominated), albeit substituting the castles for tanks and modern artillery. Central Asia is imbued with huge economic and political potential, yet few seem to realise it. A massive disparity in wealth and opportunity exists between the elite and the citizenship, whose ambitions have been thwarted by dictatorial and repressive regimes. Whether the ground-breaking achievement of this month will make a difference to the lives of ordinary citizens remains to be seen. Will the state-level sharing trickle down to the poor and needy? Without international attention, their governments may not see the immediate value in concession. A desire to protect the Caspian’s precious sturgeon population (the caviar conduit) may be a stronger incentive to clean-up the lake than the wants of those who rely on its waters for sustenance. driven far into the sea, and had much ado to keep our bark from sinking, the billow was so great: but at the last, having fair weather, we took the sun, and knowing how the land lay from us, we fell with the river Iaic, according to our desire, whereof the Tartars were very glad, fearing that we should have been driven to the coast of Persia, whose people were unto them great enemies. With the agreement of Aktau, it should no longer matter which way the winds blow. July’s historic meeting between Eritrean President Isaias Afwerki and his Ethiopian counterpart Abiy Ahmed in Addis Ababa has raised hopes of a normalisation in relations between these two troubled states. Since securing independence from Ethiopia in 1993, Eritrea has found itself in an almost constant state of near-war with its larger and more powerful neighbour. This latest breakthrough – accompanied by a resumption of cross-border flights and diplomatic exchanges – offers the tantalising prospect of lasting peace after centuries of subjugation. Strategically located on the Red Sea coast – with only a very short crossing to war-torn Yemen – Eritrea has long been coveted by the great powers. Having been a significant port in the Aksumite Empire, the region came under Ottoman control in the 16th century. Two centuries of vassalage – albeit periodically challenged by the Ethiopians – has left Eritrea with a religious makeup part Christian and part Muslim. It became an Italian colony in 1890 and served as a base for Rome’s invasions of Ethiopia in 1896 and, under international scrutiny at the height of fascism, in 1935-36. Three years of discussion at the United Nations produced more than one hundred draft resolutions and another commission of inquiry before a compromise solution was reached. The four main proposals, none of which commanded majority support in the General Assembly, were the following: (1) Ethiopian annexation of Eritrea; (2) Eritrean independence; (3) partition of the territory, giving Ethiopia the eastern (largely Christian) portion including the two main seaports, and ceding the western (largely Moslem and nomadic) half to the Sudan, then a British territory; (4) award of a U.N. trusteeship to Italy or another European power (Foreign Affairs, April 1970). As it transpired, none of these proposals played out. In 1952 Eritrea was federated to Ethiopia with UN support and by 1962, when the international community had seemingly grown tired of the long-term future of Asmara and its people, it became a province of its neighbour. Naturally this state of affairs angered many Eritreans – particularly Muslims who disavowed allegiance to the Coptic Christians in Addis Ababa – and a bloody insurgency broke out. 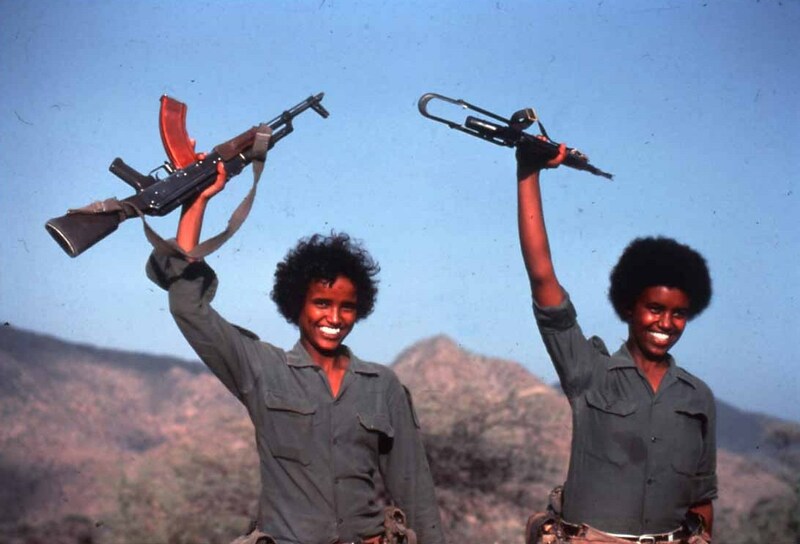 Over the next 30 years the Eritrean Liberation Front (ELF) and the splinter Eritrean People’s Liberation Front (EPLF) embarked on a guerrilla war that highlighted the shortcomings of the Ethiopian government to protect its people. It also served as one of the many proxy battlegrounds of the Cold War. An amalgam of Marxist-Leninist and social conservative groups – buoyed by a fierce religious nationalism – the ELF and EPLF eventually secured Eritrea’s independence, if not its freedom. A border war essentially persisted from the mid-1990s until 2000, its intensity raised during periods of famine and economic strife. People were displaced, brutalised and murdered. The treaty that ended the conflict was on a ‘no war, no peace’ basis, and both sides threatened to resume military action if provoked. Asmara and Addis Ababa have also tended to take very different views on regional events, the Eritreans often accused of siding with Islamist parties over the allies of the West (with whom Ethiopia often sides). The international community may well breath a sigh of relief that the end of conflict now appears in sight. For it was the great powers, and their colonial precursors, that sold Eritrea short, turning their back on a post-WWII settlement that may have averted the bloodshed of the late 20th century. Why does it matter though? Well, firstly it is nothing less than the people deserve, and this applies also to people in Ethiopia who have long been separated from their loved ones across the border. More cynically it corrects one of the geopolitical annoyances in the Horn of Africa, a region of destitution and insecurity. Sudan and Somalia remain unstable, whilst Yemen slips further into devastation across the Red Sea. Meanwhile, Djibouti has become the site of China’s first overseas military base despite it being home to Camp Lemonnier, an American joint task force station, adding a local element of great power competition. Ethiopia and Eritrea getting on is one less problem to be solved, not to mention a potential source of cooperation and support in a hostile region. After several hundred years suffering under the boot of the conqueror, now is Eritrea’s chance to forge a century of its own making.